The Andean Cosmovision provides a different-from-Western-Society way of perceiving and interacting with reality. It is not a way of thinking about the world, it is not a set of concepts and beliefs, it cannot be describe or encompassed with words. To explore the Andean Cosmovision is to enter into another way of experiencing reality that is so different from that of the West that it cannot be distinguished from actually exploring a different reality. I have found it to be a path that takes me through territory that my own society ignores. It takes me to my heart, to beauty, to love, and to a relationship with Nature and the Cosmos that fulfills my desire to sip at the cup of the sacred. It isn’t easy. It is not a path that everyone would want to take, and it certainly isn’t a path that everyone should take, for it has no dogma, it has no rules laid down by an external deity, within the Cosmovision there is no moral imperative to walk this path. If the path itself is rewarding to you then keep going (if you wish). If not, stop, and try some other path, or no path at all. That decision is something that only you can make. Broadway Books, Coleman Barks (translator). There are many different paths that lead into the Andean Cosmovision, each has its doorstep in a different region of the Andes or with a different teacher. I really only “know” the path I have been shown by don Americo Yabar and don Gayle Yabar and that I have walked for many years in the company of several dear friends. I know something about some of the other paths, not enough to describe them from experience, but enough to know that they have some noticeable differences from the path I have taken. I would like to point that out, so that you will understand that what I share in this blog may apply only to the path I know. In this path of heart the meditations serve as the portals for entering the Andean Cosmovision. That is a reality that has no limits, and I intend to be exploring it for the rest of my life, or at least so long as it continues to nourish my blossoming as a Being in this Cosmos. For me it is not a set of powers to be gained, or techniques to master, or knowledge to accumulate, it is a way of being in this Cosmos, and very much so it is a way of relating to Nature and the Cosmos. There are times in my life when I stop meditating for a while. This often happens in the winter when it is hard to go outside and I am busy teaching at the University and being all intellectual. Engaging with the politics of a world that seems to be increasingly directed by fear and hate also moves me away from meditating. Much of what I love and value is under immanent threat of destruction. There are times to meditate by the river and times to throw myself in front of the bulldozer. The two modes represent my left side and right side, respectfully, and part of what I value about this path is that it embraces all of who I am. Occasionally I get glimpses of that aspect of myself that is greater than the sum of those two parts, for whom the left side and the right side are but two facets of my existence, but we are the diamond that has those facets. Still, when I stop meditating, this path stops being something I am being, and it becomes a memory, an idea, which it can never be without losing its essence. I have discovered, rather obviously, that when I abandon this path, this connecting with the Cosmos, that I slowly start to feel abandoned by the Cosmos. I get depressed. When I start to meditate again I return to this way of being, and its essence returns and my existence again puts on a mantle of meaningfullness. My challenge is that when I haven’t meditated for a while, and I start to feel down, I don’t feel much like meditating. You might enjoy my book: The Andean Cosmovision: A Path for Exploring Profound Aspects of Ourselves, Nature, and the Cosmos. This is an Andean meditation that can only be done as a group. There are times when either on purpose, or as the result of emotional and energetic interactions, other people’s filaments get connected to our own energetic body. The intent of this meditation is to disconnect any such connections from other people, leaving us free to blossom into the beauty and essence of who we each uniquely are. We are still connected to everything else through our filaments but the boundary of our own energy is clear. When our boundaries are clear we can dance in harmony with others in such a way that the whole of the relationship becomes greater than the sum of its parts (us). This concept harkens back to the posts Yin/Yang of the Andes, Warmi-Qhari (Woman-Man), and Tinku–Confirming the Rules of Life. I have heard from friends who have trained with the Four Winds that this same process is taught there but with a different intent. In retrospect it doesn’t surprise me that the same process can have two different intents. The process is the vehicle and the intent is the trajectory. I’m struggling for a good metaphor here, but I’m afraid the one that has come to my mind is that the same tuba can be used to play many different melodies. Anyway, I am going to share the meditation as I learned it from don Américo Yábar and as I have I have practiced it for many years. For a small group, one person stands in the center and the rest of the people form a circle around him or her, standing about 10 feet from the person in the center. For a larger group, three people stand close together in the center, facing outwards. One person in the surrounding circle is the leader, initiating the action and everyone else follows along. Here is what we do. A) The people in the center simply use their intent (sincere pretending) to connect to the Pachamama through their feet and to the Cosmos through the top of their heads. They get all the benefit, everyone else gets all the fun. B1) We all start moving together toward the person/people in the center. Our intent as we move is to scoop up the filaments of the Pachamama as we proceed. The posture that facilitates this intent is to have our hands to our sides, and our fingers pointing to the ground, with our palms facing the people in the center. It helps to bend forward a bit as we move to really get the sense of scooping up the filaments of the Pachamama. As we move forward we chant “cuti cuti cuti…” (pronounced “cooty”), this flavors our intent. “Cuti” is a quechua term that means “change” or “a turning of the energy”. Thus our intent as we scoop up the filaments of the Pachamama is to activate or initiate change. There is something inherently silly about chanting “cuti cuti cuti…” as you approach someone. This whole meditation/process is best done with a good deal of panache. Get into it. Enjoy it. B2) As we get closer to the person in the middle we bend a little more so that we can pull the filaments of the Pachamama up through their feet, and then we straighten up as we pull the filaments up through their body, and then up through the top of their head. We don’t actually touch the person, our hands are a couple of inches from their body. While we are doing that we chant “ninikiriri ninikiriri ninikiriri…” (pronounced “neeneekeereeree”). The literal meaning of this ancient term has been lost in antiquity but the flavor it adds to our intent is to disconnect and bring along any filaments from the outside that are connected to the person’s body. B3) Still all moving together, as we get to the top of the person’s head we then energetically toss the energy up into the Cosmos shouting “lloqse lloqse lloqse…” (pronounced “yoksay”). Lloqse essentially means “return to sender”. This is not a violent turning of the energy back on the other person, it is simply an act of “this energy is yours not mine, it belongs to you not me”. After this, rather remarkable, procedure everyone scurries back to their original position and repeats the process two more times. At that point the people in the center join the circle and others take their place until everyone has had a chance to be in the center. Walk toward the person chanting “cuti cuti cuti…”, scooping up the filaments of the Pachamama. The only real meaning of the salka meditations I have been sharing is the effect they have on you, and you are the only authority on who you are and how you want to be. Notice how you feel after the process is over, and decide if you want to add it to your repertoire of tools for navigating through the great mystery that is the Cosmos and our existence within it. End note: as I write this I remember that Américo (when he taught us this process long ago) said that this meditation/process is from a different Andean tradition than most of the ones he teaches. My memory is that he said it is from the layqas (on the path of power) rather than from the paq’os (on the path of heart)…please see the post Paths to the Other Side of Reality. 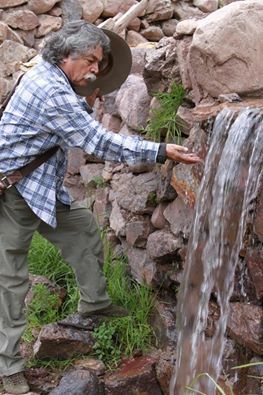 While the Andean (salka) meditations can be done indoors they are so much juicier when done out in nature. Now that spring is here I can with a big sigh of relief go up the local canyon and sit by the river to meditate. I would like to share a river meditation that I have been exploring and enjoying this spring. It was written by don Americo and translated into English by Pia Ossorio. I have changed it a little, but please know that its beauty comes from don Americo’s words (and Pia’s translation) . Sit by the riverside. Take a few full breaths, and be exquisitely aware of your breathing as you do so. This helps set the stage for shifting into another way of experiencing the world. Remember that all of the salka meditations are accomplished through intent (sincere pretending). The words of the meditation have no power on their own, they instead help us shape our intent, and it is the intent that has the power. Pause between each step and phrase below, noticing and savoring the effect it has on you, before moving on to the next. When you are finished you might want to give the river a little despacho (perhaps a few drops of alcohol or a few flowers) as ayni and to express your gratitude and to nourish your relationship with the river. The river can be a beautiful companion as you walk your path. Remember that the effect this meditation has on you is the only real ‘meaning’ of the meditation, so notice the effect, perhaps explore this meditation several times, and then decide whether or not to include it in your repertoire of steps for dancing through life. 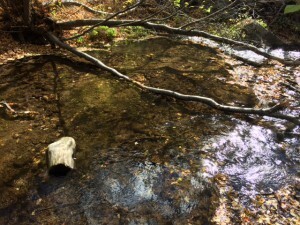 This is the second river meditation I have shared on this blog, the earlier one was called Connecting with the River. 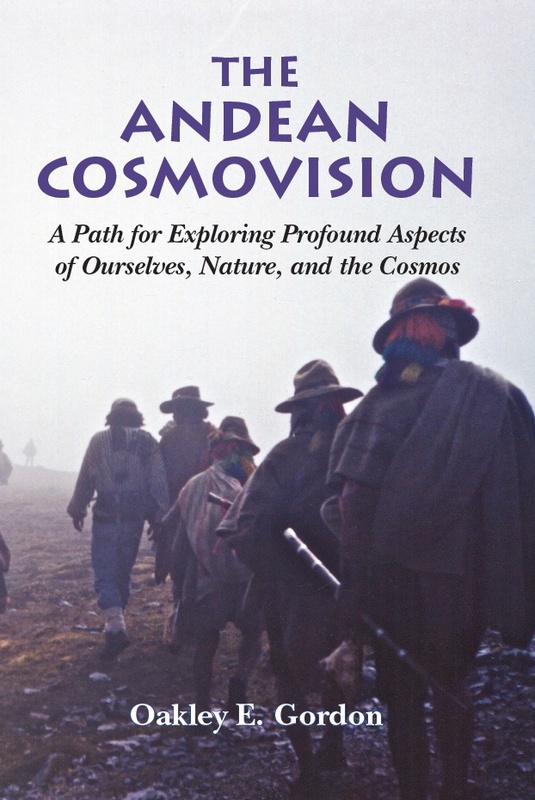 My book “The Andean Cosmovision: A Path for Exploring Profound Aspects of Ourselves, Nature, and the Cosmos” is a how-to guide for exploring the Andean Cosmovision. The Andean Cosmovision is a way of perceiving and interacting with reality that is found in the indigenous culture of the high Andes. It is fundamentally different than the Western worldview. This Cosmovision is not a set of concepts or beliefs. It cannot be described or encompassed by words. It can, however, be experienced and it can be explored. This exploration is carried out through meditations which serve as portals for exploring new facets of ourselves and the Cosmos. These meditations also nourish a more loving and mutually-supportive relationship between ourselves and nature. Within this relationship we begin to blossom into the essence of who we each uniquely are. The book presents both the Andean (salka) meditations and the concepts that help us to integrate this path with our life here in the West. It is the loving product of my 22 years of studying the Andean Cosmovision under the tutelage of my mentor and friend don Américo Yábar of Peru, and Gayle Yábar, and the many other paq’os (Andean mystics/shamans) and healers with whom don Américo has arranged for me to work. Your local bookstore. In Salt Lake City it is usually in stock at the King’s English and Golden Braid bookstores. Wonderful, open source information on Q’ero mysticism. I love this author’s simple, easy to follow approach and his open-hearted gift of this information to other serious students of Earth based wisdom. He’s not trying to sell you a spiritual retreat or a $2400.00 training program. He’s just sharing his passion for this way of life. Bravo! With an arm around our shoulders, Oakley leads us up and into the high Andes, introducing us to her majesty, her divinity, her heart, her people, and her mysteries that touch the Infinite. Exquisitely written as a narrative of self-discovery, The Andean Cosmovision is a must read for anyone interested in, or already deeply in love with, Andean mysticism. Oakley has spent years opening to the understanding of the wild culture that still lives in the high Peruvian mountains. These beautiful people have retained an innocence and a power that is truly sacred. The very real movement insights that are given here are precious and integral to our connection to nature and our heart. This may be the key to the preservation of the important elements of humankind. The book also documents in a very readable way the wisdom of the people living in the High Andes. It is the icing on the cake. Thank you! Anyone interested in understanding Peruvian philosophy and wisdom, a precursor to curanderismo, should read this book. don Americo Yabar came to lead a workshop on Salka at my school and he was very kind and full of life. This is a great book with lots of information with short and easy to read chapters explaining how the people of the Andes see reality, much different than some of the major religions today and Western society. I love this book. It is so well written and is a great guide to the simple everyday practices of loving nature and loving each other. This is a beautiful little book, based on Mr. Oakley’s blog entries, about the Andean Cosmovision. He beautifully captures the essence of many of the teachings and practices that one can learn while studying with a Peruvian paqo. Many of the meditations are those also given to me by my own teachers in Peru, and they are described with ease and economy; anyone can follow them. It is sometimes difficult to write about this subject, but Mr. Oakley does so simply and cleanly, and in a way that cuts through confusion. Don’t be fooled: this is a slim volume, but it contains much. If one were to read and follow this little volume, it would keep you busy for a few years! Highly recommended. Here is another salka meditation that can be done together by a group of people. For reasons I give later the meditation is best done by a group of from 6 to 10 people. This is yet another beautiful and powerful way to explore the Three Centers of our Being (the llankay, munay, and yachay). The meditation engages the energy that flows from the Pachamama to the Cosmos and from the Cosmos back to the Pachamama. This energy loves to spiral. As usual, it is best to precede this meditation with the Touching Pachamama meditation (to move us out of our heads and into harmony with the Pachamama) and the Releasing Hucha meditation (to get rid of our own hucha before connecting with everyone else’s energy). A fun way to set up the meditation is to have everyone hold hands and start moving counterclockwise in a large circle. The leader of this meditation then releases his or her handhold with the person on their right and starts to move the circle inward to form a spiral, and continues winding inward until the spiral is complete. However it is accomplished the goal is to form a spiral of people that goes counterclockwise from the outside in (or you can think of it as clockwise from the inside out). The innermost person in the spiral lies down on her back, everyone else in the spiral sits on the floor except the very last, outermost, person who stands. Everyone continues to hold hands with their neighbors except the innermost person (who is lying down). The person at the outermost place in the spiral raises his or her free hand up toward the Cosmos and with intent forms a connection with the Cosmos. The second innermost person places her or his free hand on the llankay of the person who is lying in the center. The llankay is located a couple of finger-breadths below the navel. With intent, she or he connects with the energy of the Pachamama and invites it to flow up through the person’s llankay, through the spiral of people holding hands, and up into the Cosmos…and back again the other direction. After forming that intent let the energy flow without controlling it, letting it change direction as it desires. The intent of everyone in between is to be a conduit of that energy, letting it flow through them, and noticing what it is like as it does. After a short time period, perhaps 30 seconds to a minute, move the hand from the person’s llankay to his or her munay (located in the heart) and repeat the same intent of connecting to the Pachamama through the person’s munay. When the person lying down is a female you can ask her to place your hand near her heart at a location with which she feels comfortable. After another short time period move the hand from the munay to the yachay (located at the crown of the head) and repeat the same intent of connecting to the Pachamama through the person’s yachay. When finished with the yachay the person in the center moves out to the end of the spiral, taking up that position. The person who was most outermost now sits down as part of the inner spiral. The new innermost person lies down and everyone in the spiral scootches in a bit to keep the spiral’s shape. Repeat the whole process, changing positions each time, until everyone has had a chance to be in the middle. It is my experience that being either the outermost or the second innermost role is pretty powerful and it also involves a very specific intent of connecting to the Cosmos or the Pachamama. I like to remind everyone in between, however, that they are more than just a conduit for the flow of energy. When this train pulls into town everyone gets to ride…the people in the middle use their intent to let the energy flow through the spiral, this is a crucial role, and they are in an excellent position to experience and learn. I invite them to sense how the energy is different when it flows through the yankay, munay, and llachay, and how it changes from person to person, and to experience how the flow of the energy is affecting themselves. Now, about the recommended size of the group. It can be of any size. I recommend at least six people simply because with less people it is more like a comma than a spiral, but there is nothing wrong with that, if you would like to try it with fewer people then feel free to do so. I also recommend not having more than 10 people simply because with more people it takes longer for everyone to get a turn in the middle (which experientially is the ‘wow’ position) and people may lose intent after a while if the whole process takes too long. Credit for this, and for all of the meditations I have shared, goes to my teacher and friend don Américo Yábar. For many years I took notes of the various meditations he taught us in the workshops I attended. I want to give him the credit while acknowledging that there must be differences between what don Américo taught us and what I am sharing with you, based upon my sketchy memory or sketchy notes, or due to changes that occur organically over time as I have shared these meditations with others. Everything I have shared has worked for me and for the people in my workshops (but remember the Two Fallacies).